Welcome to the JBC office tour! 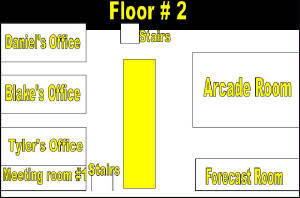 The computer will guide you through each floor. Please watch out for random reporters spinning around in chairs. The first floor of the JBC really doesn't reveal anything until you go upstairs. But you will find a nice person to greet you once you come in the door. And in the middle you'll notice some fancy tiles that have the JBC image on them. Really the only things on level one are the mail room where we process stories and fan mail. And of course the interview room where we either interview a new person or interrogate....I mean interview the Eds. So lets go up stairs shall we? 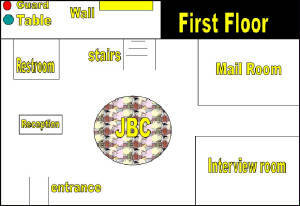 On floor two you will find the people most recently hired by the JBC. This floor is actually pretty dull as most of the time they are complaining about their conditions. So thats why we added an arcade room which they enjoy daily. The forecast room is for Tyler since he is the weather guy. We have various machines and even a computer. So we really need to continue. 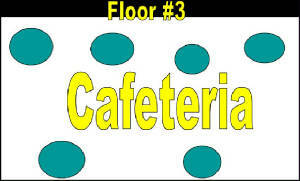 Well you know what a cafeteria is for. This is where we eat everyday and where food fights rage into the late afternoon. Here are the JBC's veteran writers. Lynn,C.H.,C.E. and Emily. These four usually work in perfect harmony but after awhile they got to each other so a brick wall was built between a few of them. They were also given a slip n slide which they requested. 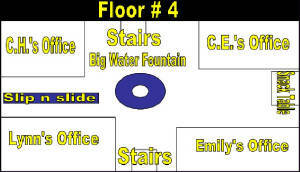 So now lets go to the very top floor. The first thing you notice is how luxurious it looks. Well thats because this is where Justin works. Justin is the editor and founder of the JBC. 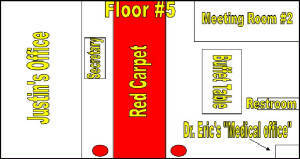 Another thing you notice is Dr. Eric's office which is 3ftX3ft. Because well the JBC saved money on their taxes. You may also notice the guards at the door. Well Justin is the main man and needs protection. The reason why Dr. Eric is up here is because he needs guards after his hundreds of mal practice suits. As you can see the JBC is a great place to visit but I wouldn't recommend living there because the employees sure don't. Watch your step on the way out and have a nice day.